The KING’S HAWAIIAN® Starring Roll Sweepstakes & IWG – Win $10,000! ENTRY LIMIT – Limit: Each entrant may enter the Sweepstakes/play the Instant-Win Game one time per day during the Promotion Period. ELIGIBILITY – The KING’S HAWAIIAN® Starring Roll Sweepstakes is open to legal residents of the 50 United States or the District of Columbia who are 18 years of age or older at time of entry. SWEEPSTAKES PERIOD – The KING’S HAWAIIAN® Starring Roll Sweepstakes begins at 12:00:01 AM Eastern Time (“ET”) on Thursday, January 1, 2015 and ends at 11:59:59 PM ET on Saturday, February 28, 2015. PRIZES – Grand Prize: There is one (1) Grand Prize consisting of $10,000 Cash which the Grand Prize winner may choose to use toward planning a VIP party. The ARV of the Grand Prize is $10,000. Instant-Win Game Prizes: There are fifty-nine (59) Instant-Win Game prizes consisting of the Sponsor’s choice of one of the following: a) There are twenty-nine (29) KING’S HAWAIIAN Starring Roll Swag Bag prize packages and each with an ARV of $40; and, b) there are thirty (30) KING’S HAWAIIAN Bread and Movie Ticket prize packages and each with an ARV of $35. WinCo “A Sweet Holiday” Sweepstakes – Win a $50 WinCo gift card! Win a $50 WinCo gift card (6 winners)! ENTER SWEEPSTAKES HERE – WinCo Sweepstakes page. ENTRY LIMIT – Limit: One (1) Entry per person/email address per day during the Entry Period. ELIGIBILITY – A Sweet Holiday Sweepstakes is open only to legal residents of the states of Arizona, California, Idaho, Oregon, Nevada, Utah, Texas, Washington, Wyoming, Colorado, New Mexico and Oklahoma who are at least eighteen (18) years of age at the time of entry. SWEEPSTAKES PERIOD – The Sweepstakes begins on December 18, 2014 at 12:00:01 a.m. Mountain Time (“MT”) and ends on December 31, 2014 at 11:59:59 p.m. MT. PRIZES – Prizes (number of prizes)/Odds. Each Official Winner will receive one (1) $50 WinCo Foods Gift Card. Total ARV of all Prizes: $300. KING’S HAWAIIAN® Hallowaiian Sweepstakes – Win a trip to Lanai, Hawaii & more! Win a trip to Lanai, Hawaii & $500! You may skip the photo submission and just have 1 entry – or submit a photo for 5 extra entries. ENTRY LIMIT – Each Photo Submission may only be submitted once by one (1) person and there is a limit of one (1) Entry and up to five (5) Additional Entries per person during the Promotion Period. ELIGIBILITY – The KING’S HAWAIIAN® Hallowaiian Sweepstakes is open to legal residents of the 50 United States or the District of Columbia who are 18 years of age or older at time of entry. SWEEPSTAKES PERIOD – The KING’S HAWAIIAN® Hallowaiian Sweepstakes begins at 12:00:01 AM Eastern Time (“ET”) on Wednesday, October 1, 2014 and ends at 11:59:59 PM ET on Saturday, November 15, 2014. PRIZES – Grand Prize: There is one (1) Grand Prize consisting of a vacation package for winner and one (1) guest for four (4) nights and five (5) days to Lanai, Hawaii. -Two (2) round-trip coach airfares between the major United States gateway airport closest to the winner’s residence (selected by Sponsor in its sole discretion) and Lanai, Hawaii, provided however, if winner resides on the island of Lanai, no air or any ground transportation will be provided. -Two (2) round trip ground transfers between Lanai Airport and hotel; provided, however, if winner resides on the island of Lanai, ground transfers will not be provided. -Deluxe hotel accommodations (one (1) standard room with a maximum of two (2) persons per room) for four (4) nights as selected by Sponsor in its sole discretion. -Two (2) Admission tickets to Keahiakawelo and Garden of the Gods. The ARV of the Grand Prize Vacation Package is $5,900. 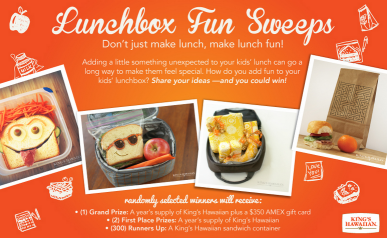 King’s Hawaiian Lunchbox Fun Sweepstakes – Win a $350 American Express gift card & more! Win a $350 American Express gift card & a year supply of King’s Hawaiian products! 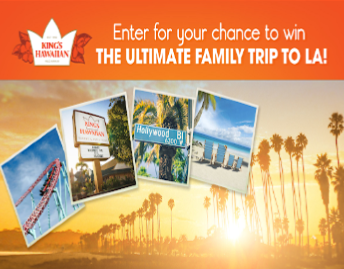 ENTER SWEEPSTAKES HERE – King’s Hawaiian Facebook page. ENTRY LIMIT – Limit: Each person may enter one (1) time per day by registering for the Sweepstakes during the Promotion Period. Earn bonus entries when your friends enter using your link. ELIGIBILITY – KING’S HAWAIIAN® Lunchbox Fun Sweepstakes is open only to legal residents of the fifty (50) United States and the District of Columbia who are at least eighteen (18) years old at the time of entry. SWEEPSTAKES PERIOD – The Sweepstakes begins on August 1, 2014 at 12:00 a.m. Eastern Time (“ET”) and ends on August 29, 2014 at 11:59 p.m. ET. PRIZES – ONE (1) GRAND PRIZE: A one (1) year supply of KING’S HAWAIIAN® products (awarded in the form of fifty-two (52) free product coupons) and a $350 American Express® gift card (terms and conditions apply). Approximate Retail Value (“ARV”): $600. TWO (2) FIRST PRIZES: A one (1) year supply of KING’S HAWAIIAN® products (awarded in the form of fifty-two (52) free product coupons). ARV: $250. THREE HUNDRED (300) SECOND PRIZES: A KING’S HAWAIIAN® branded sandwich container. ARV: $5. 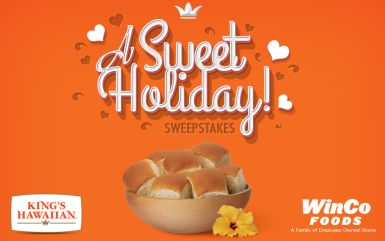 King’s Hawaiian Five-Oh So Sweet Sweepstakes – Win a trip to Honolulu & more! Win a trip to Honolulu, Hawaii, $1,000 spending money and the opportunity to be an extra in a taping of Hawaii 5-0! ENTRY LIMIT – Limit one entry per person per day. Earn bonus entries by sharing the sweepstakes with friends or by entering a King’s Hawaiian code from Pinterest. ELIGIBILITY – Five-Oh So Sweet Sweepstakes is open only to legal residents of the fifty (50) United States and the District of Columbia who are at least eighteen (18) years old at the time of entry. and ends on May 1, 2014 at 11:59 p.m. ET. subject to availability and blackout dates. Travel must be round trip. Approximate Retail Value (“ARV”): $8,275.